← “I now have doubt about sorting the doctrinal from the papal opinion.” Fr Z replies. 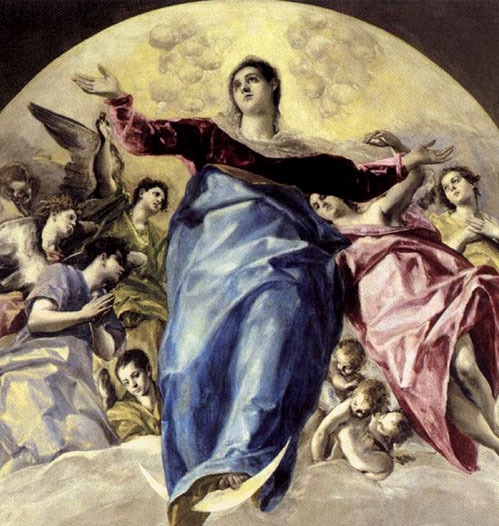 The Assumption of the Blessed Virgin means that after Her life on earth, Mary was taken body and soul into Heaven. Unlike other saints, therefore, Our Lady is in Heaven not only with Her soul but also with Her glorified body. Pope Pius XII defined this doctrine as a “divinely revealed dogma” on November 1, 1950. The Mother of God was conceived without original sin. Consequently She did not have to wait, like the rest of us, for the resurrection on the last day. She is with Her Divine Son in the same body – although now resplendent in glory – that She gave Him at Nazareth. He ascended bodily into Heaven forty days after His Resurrection. She was assumed bodily into Heaven after She completed Her stay on earth, some fifteen years later. For about fourteen hundred years, the Feast of the Assumption has been celebrated on August 15. It is now one of the holy days of obligation for the universal Church (Canon 1246), when “the faithful are bound to participate in the Mass; they are also to abstain from those labors and business concerns which impede the worship to be rendered to God” (Canon 1247). Mary’s bodily Assumption is the promise of our own glorious resurrection from the grave – provided we pray. Without prayer we cannot remain faithful in our service of God. Mary’s assumption is the proof of how profitable it is to make sacrifices. Not the least of these sacrifices is the surrender of our bodily pleasures that are contrary to the will of God. The eternal reward is worth the temporal price we have to pay in self-control. By now giving up what we like but what is sinful, and enduring what is painful to us but pleasing to God, we shall enjoy Heaven with Jesus and Mary – in body and soul – in the world to come. Forget this pope, he is just a quick trial for us, he will go away and Christianity will remain.